Last Date to attempt for the job: 20th Sep-2016. 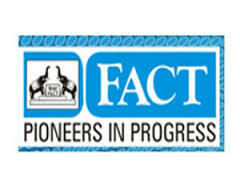 The Fertilisers and Chemicals Travancore(FACT) Limited,is a fertiliser and chemical manufacturing company in Kochi,Kerela,India is now opens notification for the dedicated candidates to apply online for the posts of Technician (Process). Required Qualification : Degree in Chemistry/ Industrial Chemistry OR Diploma in Chemical Engineering / Chemical Technology (Including Petrochemical Technology), Payment: Appointment will be on fixed salary during the initial 2 years. Consolidated salary per month will be Rs. 16000/- during the 1st year and Rs. 17000/- during the 2nd year. After employee On complete the period of 2 years on fixed salary those employees will get Rs. 9250-32000/- who successfully clear the test/interview held by the company. Rs. 500/- (excluding bank charges) for Unreserved and OBC candidates. SC/ST/ PWD candidates are not liable to pay any application fee but they have to present document in proof of eligibility for exemption . Candidates has to apply Online at FACT Kerala website prior to 20/09/2016.